For anyone wishing to learn about Avebury from scratch the site is designed to be gone through in the order the menu is presented. Although some personal views are expressed on occasion great care has been taken to provide information that comes from reputable and reliable sources. Unlike a published book, a website has the advantage that it can be continually revised and updated.....a process that Avebury itself seems to have been subject to. As my own ideas evolve and fresh information comes to light I hope that most regular(hopefully!) visitors to this site will appreciate any changes that are made. found via the Silbury Hill page see: "The Silbaby Question"
A full facsimile copy of William Stukeley's book "Abury - A Temple of the British Druids" has now been added to the site. Although Stukeley's own exotic and academically inspired theories dominate much of the text, for researchers it remains one of the most important and essential sources of information about Avebury's past. The book contains a large scale plan which Stukeley made of the henge. This contains much fascinating information and can be found via "The Shame" page. PLANNING A DAY TRIP ? The primary sources of information for this website have been Aubrey Burl's excellent "Prehistoric Avebury" (second edition), "Windmill Hill & Avebury - Excavations by Alexander Keiller 1925-1939" (Isobel Smith). "Avebury" by Joshua Pollard & Mark Gillings. "Landscape of the Megaliths" by Mark Gillings, Joshua Pollard, David Wheatley & Rick Peterson. William Stukeley's "Abury - A Temple of the British Druids" is an invaluable resource and many smaller publications have supplied a wealth of interesting and useful information. Although my own views don't neccessarily reflect those of current researchers the staff of Southampton University amongst other individuals have been very helpful in supplying information & advice on some elements of the website. larger than normal/medium the pages may not display correctly. the text size depending on the language selected. The dates given for the monuments throughout the site should be treated with some caution....see the Chronology page for details. Published by Oxbow Books is "The Landscape of the Megaliths" by Mark Gillings, Joshua Pollard, David Wheatley & Rick Peterson. 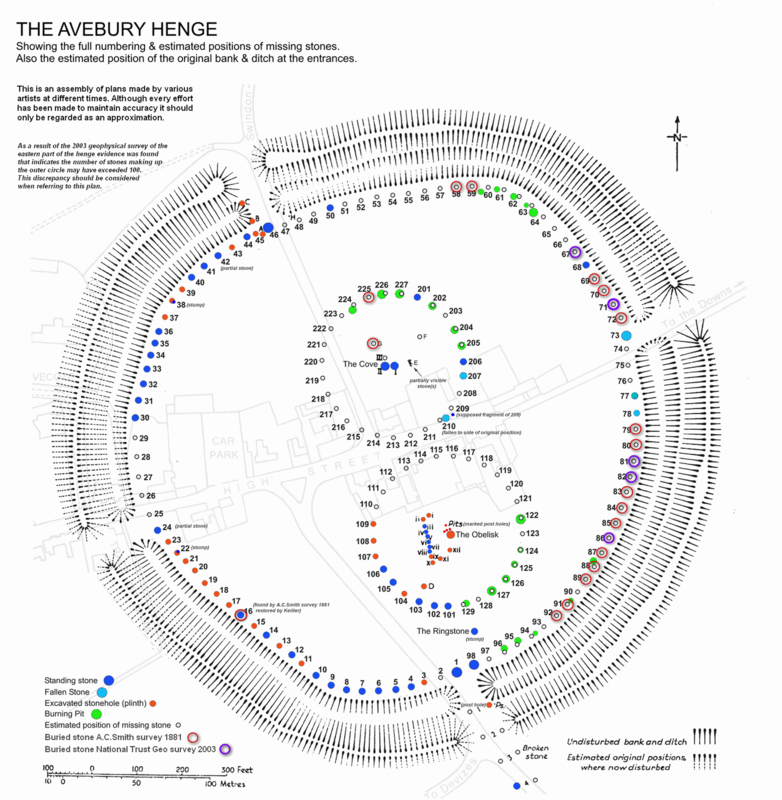 This covers in detail the results of the excavations that were carried out at Avebury during the period 1997 - 2003. It also includes much reappraisal of long held ideas about the monuments and must be regarded as essential reading for all pursuing the most current information. Hugo Jenks has produced an Avebury calendar with some nice photographs. The Avebury Community Shop now serves the village. places to stay are listed on the Village page. "WEST KENNET LONG BARROW: Landscape, Shamans and the Cosmos." Now updated with results of 2003 geophysical survey. For more detail about this plan see "The Marmalade Man" page.